This is the original art for page 10 of Cerebus issue 40. It features a slient Cerebus and an unconcious Moon Roach. Signed at the top in pen: "To Jason - Best wishes and Thanks Dave Sim" with the word "Reverse" written above the "Thanks" and an arrow pointing down in pencil. Has been in my posession since approx 1985 when it was sent to me for helping Dave Sim at the Atlanta Fantasy Fair that year. 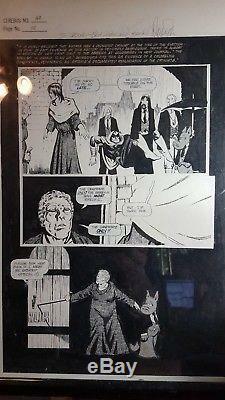 The item "Cerebus original art #40 pg. 10" is in sale since Friday, October 20, 2017. This item is in the category "Collectibles\Comics\Original Comic Art\Interior Pages". The seller is "blackbirdfinery" and is located in Smyrna, Georgia.